Difference between revisions of "Nigeria"
We have checked with various international Colleges of Magic, and none has any record of a Nigerian magician using the stage-name "Son of Dr Who"; but of course this person may not even have been a magician nor registered with a College. But there ''was'' someone calling themselves "The Son of Dr Who?" (with a question-mark). An Occultist Spiritualist, Talisman and Charm dealer based in Lagos state called '''THE SON OF DR WHO? ''', [https://www.google.co.nz/webhp?sourceid=chrome-instant&ion=1&espv=2&ie=UTF-8#q=%22son+of+dr+who%22+%2B+Occultist&tbm=bks advertised their services in a 1979 African publication called "Drum"]. But there ''was'' someone calling themselves "The Son of Dr Who?" (with a question-mark). An Occultist Spiritualist, Talisman and Charm dealer based in Lagos state called '''THE SON OF DR WHO? ''', [https://books.google.co.nz/books?id=74E6AQAAIAAJ&q=lagos+%2B+%22dr+who%22+occultist&dq=lagos+%2B+%22dr+who%22+occultist&hl=en&sa=X&ved=0ahUKEwjtmu-CpOfVAhWEy7wKHWYrCKYQ6AEIJjAA advertised their services in a 1979 African publication called "Drum"]. And there is also a [https://www.facebook.com/pages/Son-of-Dr-WHOLagos-Nigeria/255611147789660 placeholder Facebook page] for a "public figure" in Lagos of the same name and also with a question-mark! NIGERIA is in west Africa. 6.1.1.1 *Origin of the Prints? 6.1.2.1 *Fate of the Prints? 6.3.1.1 *Origin of the Prints? 6.5.1.1 *Origin of the Prints? 6.5.2.1 *Fate of the Prints? Nigeria is the most-populated country in Africa. By the 1990s, the country had been divided in over 30 states. And each of these had its own television service. As WNTV's reach began to grow in the 1970s, it merged with a number of other TV stations in other parts of Nigeria, such as RKTV and NBC. It then merged with Mid West TV in Benin, and later with Benue Plateau in Jos. WNTV commenced colour broadcasts in 1975 when it absorbed BPTV (see below). It was re-branded as NTV-Ibadan in 1976. Radio-Television Kaduna / Radio Kaduna Television (RKTV): established in March 1962, based in Kaduna, and operated by the Broadcasting Company of Northern Nigeria (BCNN), RKTV provided coverage to the north of the country (a region later divided into the North-Central, North-Western, North-Eastern, Kano, Kwara and Benue-Plateau states). It was re-branded as NTV-Kaduna in 1976. Nigerian Broadcasting Corporation (NBC): a federal government-owned service, established in April 1962 (with the involvement of Television International Enterprises Ltd), based out of Victoria Island in the then-capital city of Lagos, and broadcasting to the south western states. It merged with WNTV and was re-branded as NTV-Lagos in 1976. MidWest TV: the state government in Benin established a TV service from Port Harcourt in 1972, broadcasting to the southern regions Benin and Rivers. It was also known as MTV. It was re-branded as NTV-Port Harcourt in 1976, by which time the region had been split into the Bendel and Rivers States. Benue-Plateau Television Corporation (BPTV): originally part of the RKTV "network" (see above), based in Jos, in central Nigeria; it was established in June 1974, and was the first to launch regular and permanent colour broadcasts in Africa (colour test transmissions commenced 1 October 1975). The Benue Plateau Broadcasting Corporation, which was later created to control both television and radio services, was officially inaugurated on 25 February 1975. It was re-branded as NTV-Jos in 1976. NTV: in 1976, the federal government established the Nigerian Television Authority, based in Lagos, under which all the major television services across Nigeria were controlled by a single body, although each continued to broadcast its own separate schedules of programming. Although the TV stations began using their new call-letters from 8 April 1976 (each station had the new pre-fix ident NTV) formal amalgamation didn’t commence until May 1977. Despite the country's large population, only the "rich" could afford to own a television set, but bars and restaurants often had a set for the benefit of their customers. Nigeria has over 235 languages and dialects, although English is the principal common language. Regional television broadcasts contained an equal mix of foreign programming in English, and locally-produced cultural, religious and educational content in regional languages. Although BBC Records identify sales of Doctor Who to the generic name of "Nigeria", these disparate sales were to different broadcasters across the country. In another memo dated 1966, the series was noted as being sold to "Nigeria (N & W)". Northern Nigeria was served by RKTV, and Western Nigeria by WNTV. It's not clear if this meant one sale and one screening to both regions at the same time, or one sale and two screenings on a regional basis, or two sales and two screenings. However, as far as we can tell, Doctor Who did not air on WNTV. The Stanmark Productions Ltd advertisement from 1966, identifies Nigeria as one of sixteen countries screening Doctor Who by January 1966. Nigeria is named in the list of 27 countries in The Making of Doctor Who 1972 Piccolo edition. The Seventies records a sale of "(24)" stories by 28 February 1977. The Handbook identifies these as being: A, B, C, D, E, F, G, H, J, K, L, M, N, P, Q, R, S and BB for Hartnell; and NN, PP, QQ, SS, TT, and WW for Troughton. In DWM, Nigeria is identified in 28 story Archives: the same 24 as in The Seventies, plus 4A, 4B, 4C, and 4D, with the dates of sale recorded as 1965 as the earliest, and 1979 as the latest. In The Eighties - THE LOST CHAPTERS, there are "(4)" sales noted for Nigeria prior to February 1987. Those likely equate to the four Tom Baker stories as noted in DWM, although it appears that far more than only four Tom Baker stories aired. With Doctor Who screening on several different channels over the years, it appears that each station bought from the BBC whatever stories were still available at the time, hence why some of the runs of stories are so disjointed. Radio-Television Kaduna / Radio Kaduna Television (RKTV) was established in March 1962 in Kaduna, and was operated by the Broadcasting Company of Northern Nigeria (BCNN). It was re-branded as NTV-Kaduna in 1976. RKTV covered the Northern and largest region of Nigeria. RKTV therefore bought the standard package of William Hartnell stories, GROUPs A to E that was available to English-speaking Commonwealth countries. The programme was supplied as 16mm black and white film prints with English soundtracks. Since Nigeria was the first African nation to buy the series, RKTV would have received fresh prints from the BBC. The series made its Nigerian debut on Radio-Television Kaduna / Radio Kaduna Television (RKTV), Tuesday, 3 August 1965, at 6.35pm. It stayed on that day of the week and timeslot throughout the run. In an article / interview with William Hartnell published in the 24 April 1966 issue of the UK newspaper, Daily Mirror, it is noted that Doctor Who is "a knockout in Nigeria". The last clear listing for Doctor Who on RKTV was on 18 April 1967 -- but assuming there were no interruptions, this would be the 90th episode, nine more than the number of available episodes. We can only assume that there were nine pre-emptions during the run. Assuming that all 81 episodes played without interruption or pre-emption, and that the final seven listings in the papers were printing errors and should be for The Strangers, Doctor Who ended on 14 February 1967. It is very possible that RKTV forwarded its prints of the first 26 episodes / five William Hartnell stories to Ghana. If, as is noted above, there were indeed subsequent regional screenings of the same episodes elsewhere in Nigeria, the episodes may have been returned from Ghana for that purpose. The first eleven serials (up to The Rescue, may have gone to Kenya. It has been reported that a TV station in Africa had phoned the BBC (in the late 1990s?) to inform they had a full set of black and white episodes of Doctor Who, and that after determining that it was the first two seasons, the BBC staff member told them they were not required and that they could be destroyed! It's not known what country this was, but if it was Nigeria, that could only be the case if the films had been retained for internal bicycling rather than external bicycling. Alternatively, the other Nigerian episodes were subsequently forwarded directly to Sierra Leone, who commenced screening the series only a month after Nigeria had aired the final episode of The Time Meddler. The listings for RKTV have been obtained from the Lagos newspaper, Daily Times. All billings identify the series as "Dr Who". Several issues did not contain listings for RKTV, and some had no TV listings at all. September to November 1966 was particularly bad for missing listings. And in April / May 1967, the lack of TV listings makes it unclear when Doctor Who ended and the replacement show "The Strangers" started. BBC Records indicate that by the early 1970s, only a handful of the William Hartnell stories were still available to purchase. MidWest TV (aka MTV) therefore bought at least two of these, both of which had previously screened on RKTV in 1967. IMPORTANT NOTE: There is some uncertainty as to whether all three serials were sold to the same station. The BBC's records have both The Web Planet and The Time Meddler being sold to "Nigeria" under the same invoice number (2050), and clearance royalties paid out on 25 July 1973, whereas the sale for The War Machines had royalties paid out two weeks earlier, by 10 July 1973, but with a sequentially later invoice number (2508). Therefore, it is extremely likely that the first two stories were sold together to one station, while The War Machines was sold to a completely different station. And the fact that only ten clear airdates have been found for MidWest does support the sale of only one 6-parter and one 4-parter. If The War Machines did not screen on MidWest TV, then it would have been on one of those other three stations and/or their affiliate or relay stations. This profile therefore could apply to two different stations. The prints of The War Machines that were supplied to Nigeria came from Singapore. Singapore had in turn received the prints from New Zealand; they had been dispatched by the NZBC on 10 January 1972. The prints had been cut by the New Zealand censors; although it appears that MidWest (or whoever the broadcaster was, if not MidWest) or the Singapore broadcaster had made further cuts to episodes two and three. It is not known where the MidWest copy of The Web Planet came from. The returned film prints still had the original BBC countdown clock leaders on them; since these are usually (but note, not always) removed by a broadcaster, it's possible that the prints were a fresh set sent by the BBC. Alternatively, the films were bicycled from a previous broadcaster. The serial did not screen in New Zealand due to censorship, and the fate of the film prints held by the NZBC was not recorded, but it is possible that The Web Planet was sent to Nigeria at the same time as The Time Meddler. Or, since Singapore sent The War Machines to Nigeria, they may have also been responsible for supplying The Web Planet. Another possible source for these six films was Ethiopia, the previous African nation to have aired the story (in November 1971). The film prints for The Time Meddler were sent to Nigeria from New Zealand on 2 March 1973, which was only a month ahead of the MidWest transmission. These episodes had been cut by the New Zealand censors. However, it appears that Mid West was responsible for removing the first few minutes of the opening TARDIS control room scene, which had the first onscreen appearance of Steven Taylor. After a six year break, Doctor Who returned to Nigerian televisions; now screening on MidWest TV, which, despite the name, broadcast to southern regions of Nigeria. It is not clear when this run commenced - the first TV listings for MidWest TV appear in the 24 April issue, and the first billing for Doctor Who -- given as "Children's time Dr Who" -- appears in the Monday, 30 April 1973 issue; the timeslot is from 6.30 to 7.30pm. "Children's Time" also aired on Wednesdays and Fridays, with the shorter timeslot of 6.30pm to 7.00pm. However, if the 30 April entry is indeed the first, which means there are only ten billings, it's possible that sometimes Doctor Who occupied the full hour; did two episodes air back to back on some of these dates? (Indeed, the fact that the prints of The War Machines recovered from Nigeria had trims from the cliffhanger of episode two and the recap at the start of part three does suggest that those two episodes had possibly been spliced together.) Otherwise only ten episodes played – as noted above, this might be The Web Planet and The Time Meddler only, and The War Machines was indeed sold to a different station. And if there are indeed 14 episodes on the same station to account for the newspaper simply did not carry the listings for MidWest for all of April, and the first four episodes of the run, being The War Machines, which was the first to be sold, are omitted from the TV listings page. It was a passing comment on a 1984 BBC Radio 2 programme that Nigerian television was so far behind the times that Patrick Troughton was still the Doctor over there that prompted Ian Levine and the BBC to contact Nigerian TV stations in the search for missing episodes. This contact resulted in the recovery of The Web Planet, The Time Meddler and The War Machines, of which episodes were missing from the BBC archives. The fact that all three stories were recovered at the same time has little bearing on their being screened by the same broadcaster; from April 1976 all the major television services across Nigeria were incorporated and controlled by the NTA, which also took control of the film holdings of these stations. As such MidWest (and the 'other' station if there was one) had apparently been instructed to forward their film holdings to the same central location, the facility from which the 14 films were later recovered. All 14 of these Hartnell episodes were subsequently returned to the BBC in 1984/85. Part one of The Time Meddler was missing parts of the opening TARDIS scene. This does not appear to have been cut in New Zealand, as the episode's running time is correct in NZBC's records. Did Nigeria cut the scene, or were they supplied with part one cut by the BBC as an Audition print? The BBC already held copies of The Web Planet: a set of uncut negatives plus a set of prints, which were incomplete (part one was missing the opening recap from The Romans and part six had an alternative "NEXT EPISODE" closing caption). The returned "Nigerian" prints were complete and uncut. Listings for MidWest TV come from the New Nigerian, which was published from Kaduna. This paper only started publishing listings for MidWest from Tuesday, 24 April 1973, so it is unclear when exactly Doctor Who started; the first of only ten listings is dated 30 April 1973, and there are 10 or 14 episodes to account for. The six available airdates billed the series as "Children's time Dr Who". The "missing" four episodes may have aired in April, or, as noted elsewhere, on an entirely different station. There were no papers available for 7 May or the last three weeks of June 1973. From July 1973, New Nigerian only occasionally published MidWest TV listings. Benue-Plateau Television Corporation (BPTV) was established in Jos in June 1974, on Channel 7; it was initially part of the RKTV network. It was the first TV station in Africa to launch regular and permanent PAL colour broadcasts, from 1 October 1975. It was re-branded as NTV-Jos in 1976. BPTV - Dr Who, 29 April 1975 – is this the last ever broadcast of The Wheel in Space part 6? The four stories had screened in New Zealand between September 1970 and September 1971. New Zealand did not screen The Ice Warriors or Fury from the Deep, neither of which screened in Nigeria. Based on the way programmes were sold by the BBC at this time, it appears that the Nigeria sale (a minor Commonwealth broadcaster) could only include those four stories because they had previously been purchased by New Zealand (a major Commonwealth broadcaster). These four serials (from GROUP D of the Patrick Troughton stories) were initially purchased by RKTV, but if and when the Kaduna station aired them first is unknown, as no TV listings could be found. Less than two years after the MidWest TV screenings, Doctor Who was seen again in central Nigeria. We have been unable to ascertain precisely when the run of episodes commenced (due to lack of TV listings prior to April 1975), but the final of only three listed episodes was on Tuesday, 29 April 1975, at 9.15pm. With 24 episodes to account for, and if the series ran without interruption (there may have been breaks over Christmas / New Years), it potentially could have commenced on 19 November 1974 (which certainly ties-in with the date of sale being by October 1974 as recorded in BBC paperwork). But of course there is no absolute certainty that all 24 episodes aired in one continuous run. There are only three published listings, which really only tells us that half of one serial at least screened! It is entirely possible that the others weren't aired at that time, but were held over and didn't reach the screens for a few more years. Maybe it was these "late" screenings that were seen by the BBC technician, possibly explaining how says he saw Patrick Troughton episodes during a visit to Nigeria in the early 1980s -- see section below. BPTV was the last-ever television station to screen these four stories. When the NTA was established in 1975/76, the film prints were retained at the BPTV station, possibly because they were intended to be but ultimately weren't bicycled around other regional stations owned by RKTV. 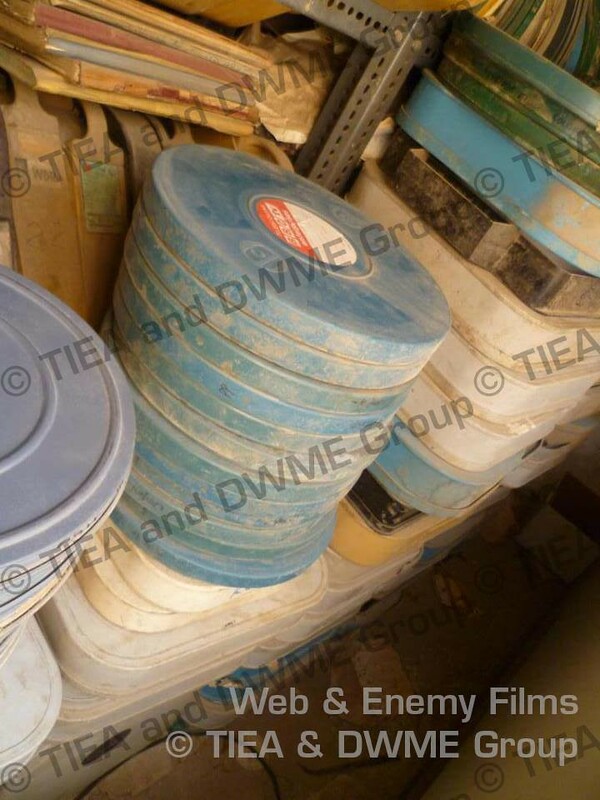 By late 2011, all 12 prints of The Enemy of the World and The Web of Fear (all still in the ex-RTV Hong Kong film cans) were located by Phil Morris at the upgraded Jos zonal relay station. Sadly, the third episode of The Web of Fear disappeared from the station before it could be shipped to the UK. The other 11 films were eventually returned to the BBC in 2013. Listings are from the Jos newspaper, The Nigeria Standard. The paper was published on Sundays only, but with TV listings for the full week. TV listings were not published prior to the 13 April 1975 issue. Only three billings for "Dr Who" were found – 15, 22, 29 April 1975. All papers were checked to the end of 1975, and despite regular TV listings appearing, there were no further listings at all for Doctor Who. Therefore, we assume that these listings are for the final three of the 24 episode run. The two programmes were supplied as 16mm black and white film prints with English soundtracks. However it is not known which station in Nigeria this was; BBC Records indicate that royalties for the sale of The Dominators to "Nigeria" (under invoice number 14563) were paid out on 20 November 1975, and for The Krotons (invoice 15670) on 6 February 1976. But there is no certainty that both stories were actually sold to the same station. Since BPTV was preparing to transmit in colour by October 1975 the station may not have been purchasing any further black and white material in the lead-up to that launch. Also, newspapers to the end of 1976 were checked and there were no listings at all for Doctor Who that year, so we think it safe to exclude Benue Plateau TV from this list of potential stations. Singapore had already supplied MidWest with at least one serial in 1973, and had previously furnished RKTV / BPTV with four stories in 1974 -- see both above -- so it is possible that RTS was being used as the go-to supplier for further film prints destined for Nigeria. One or both serials may have come from that source. If the unidentified station was RKTV, then that means Kaduna was probably the BBC's main sales contact in Nigeria. Alternatively, the film prints of one or both of these two serials were supplied via Gibraltar which, like the Nigerian Broadcasting Corporation, had an affiliation with TIE Ltd.
No listings could be found for Dr Who / Doctor Who in any newspapers for late 1975 or during 1976. What is not clear is, is this a billing for Doctor Who (in which case given the unusual billing, did the programmers or editorial staff think Troughton's Doctor was the son of Hartnell's? ), or is it for something else? Many of the papers before and after the dates found are missing or do not have programmes listed prior to 6.00pm, so it's not clear exactly how many previous or subsequent episodes of "Magic Hour - Son of Dr Who" there may have been between November 1975 and March 1976, which happen to be the two months identified in BBC records for when Doctor Who had been sold to Nigeria. It could be a simple case of NBC initially auditioning then purchasing and screening just The Dominators to begin with, then purchasing and screening one further story, The Krotons, a few months later, a date range for which TV listings were not published. WHO IS THE SON OF DR WHO? However, further research into the name "The Son of Dr Who" has revealed that there was someone who used that as a stage-name. In his online biography, Dr. Oluaiye Mobolaji Alimi Salami Naibi Oba Ogboni, reports that he studied magic in London, and on returning to Nigeria, "was the in-house magician performing on NTA Channel 10 with late Professor Peller and son of Dr. Who between 1976 – 1978." This implies that Dr Ogboni, Professor Peller and Son of Dr Who were three television personalities performing together on NTV-Lagos Channel 10 during the late 1970s. Of course that would make it an extreme coincidence that someone calling themselves "The Son of Dr Who" was appearing on television around the same time that Doctor Who should also have been on somewhere in Nigeria, and for which separate listings cannot be located. But it is possible that Ogboni's biographer has simply got his/her facts slightly askew; when they say Ogboni appeared with "the late Professor Peller and son of Dr Who" they might mean that he was on television in the same hour of programming that included Peller's magic show which was paired with Doctor Who. But there was someone calling themselves "The Son of Dr Who?" (with a question-mark). An Occultist Spiritualist, Talisman and Charm dealer based in Lagos state called THE SON OF DR WHO?, advertised their services in a 1979 African publication called "Drum". And there is also a placeholder Facebook page for a "public figure" in Lagos of the same name and also with a question-mark! All of which does seem to point to "The Son of Dr Who?" being a title used by a well-known Nigerian Occultist who appeared on television with Professor Peller, and therefore the newspaper listings found are not billings for Doctor Who. Then there's the question of where did the name "Son of Dr Who?" itself come from? Had this person seen the screenings on one of stations in the 60s or 70s? ; or perhaps they had seen the Peter Cushing movies? ; or was it something they had devised without any prior knowledge of the series? If the four listings for "Son of Dr Who" are for Doctor Who -- with the newspaper messing up the billings (something that is not unusual for Nigerian newspapers), with the paper thinking the TV series called "Dr Who" had something to do with the Occultist The Son of Dr Who, and changing the title of the billings accordingly, or the 4.00pm show featuring both the Occultist The Son of Dr Who and Doctor Who in the same one hour block -- the four available published listings are therefore the start, middle or end of a run of episodes that potentially included either of or both The Dominators and The Krotons. There is a possibility that the three April 1975 listings identified for BPTV in Jos (as detailed above) were actually for The Dominators or The Krotons. We just don't know. Even though we don't know for sure where and when these episodes aired, Nigeria was in the event the final country to purchase and screen these two Troughton serials. Many Nigerian newspapers were searched for 1974, 1975 and 1976. Many of them did not print any TV listings at all, and those that did often only printed one or two stations from time to time, and not always the same ones on a regular basis -- for instance, one paper printed listings for three stations one week, then the following week an entirely different set of stations. But there were no listings found for Doctor Who, which makes it difficult to narrow down when and where these nine episodes screened. The billings for "Son of Dr Who" on NBC-TV have been obtained from the New Nigerian, which was published from Kaduna. Listings for that channel were infrequent, and prior to the four listings that have been ascertained, the paper only printed programming that was after 6.00pm (with "Magic Hour - Son of Dr Who" screening at 4.00pm, it was therefore missing from the previous listings) while in the next nine weeks after the last of the "Son of Dr Who" listings, the paper was either missing or didn't include listings for NBC-TV. Colour broadcasts had commenced in Nigeria in 1975 (on BPTV and WNTV), and all the NTA stations were converted to PAL colour in due course, although most viewers still only had black and white sets. When Doctor Who returned to Nigerian TV screens in the late 1970s, it screened on a number of (if not all) the NTA / NTV stations across Nigeria. Some of the stations may even have continued to repeat the series well into the 1990s. The entire Jon Pertwee era was skipped (although see note below about Day of the Daleks), and instead viewers saw Tom Baker's fourth Doctor. Although The Eighties reports a sale of only four stories up to 1987, it is clear from the airdates that far more stories aired. Other BBC Records indicate that the first four stories were Robot, The Ark in Space, The Sontaran Experiment, and Revenge of the Cybermen, sold by September 1978. The NTA stations therefore would have bought GROUPs A to C of the Tom Baker stories. The episodes would have been supplied on PAL colour video tapes (most likely U-Matic), with English soundtracks. The series screened weekly at 6.30pm. The run lasted for 72 weeks, from 8 January 1979 to 19 May 1980. For 11 dates during the run, something else was listed in that slot. But the listings for "Marine Biology", "Young World", "Komai da Ruwanka" (*) and "A Gani Na" (*) may be symptomatic of the duplication errors that affected the New Nigerian back in 1974. The fact that 72 is also the same episode-count for Robot to The Talons of Weng-Chiang does suggest that these were the only stories that aired. (*) These two programmes are in Chadic, a language spoken in Ghana and Nigeria; the former literally translates as "Everything that your water" (whatever that means!) and the latter as "How to see". A Gani Na is listed in the 6.30pm slot through until the end of August 1980. The NTV-Kano listings are from the New Nigerian. All billings are given as "Dr Who". There was no listing for NBC-Kano in the 1 January 1979 paper, so it's possible the series commenced earlier than 8 January. Season 12 of the series (at least) aired on NTV-Ilorin "around 1989 or so", as THIS FORUM POSTER recalls; they even post several pictures of the episodes they remember seeing. "The other great British role is the Doctor. I have been a fan of Doctor Who since I was a child, hiding behind the settee scared silly, just as the programme-makers would have wanted. The bulk of that fandom was formed in the same country where nine lost episodes were recently found gathering dust in a TV facility in a northern city – Nigeria. I grew up watching Doctor Who with my family in Lagos, and I'm not terribly surprised by the find – pre-internet and long before international fan conventions in San Diego – Doctor Who was a big deal in Nigeria. And as for the tapes being decades old, that makes sense too – in the late 80s and 90s when we were there, while all the British kids were watching Sylvester McCoy ("Seven"), my Doctor was "Four" aka Tom Baker, an actor who had vacated the Tardis before I was even born." This TWEET from May 2013, refers to Tom Baker on "NTA 2 Channel 5", which was the second of two channels operating out of that city. This TWEETER in October 2010 asks if anyone "grew up watching Dr Who in Naija". And this FORUM contains several posts about the series. In a comment posted on THIS BLOG, the writer recalls seeing the series "on Sunday evening at 6pm" on a black and white TV. Similarly, THIS WRITER, recalls "watching Doctor Who every Sunday". Several posters HERE recall seeing the Daleks, Pyramids of Mars and The Brain of Morbius in the 1980s. Further down the same thread, THIS POSTER says Day of the Daleks was a frequently-repeated serial, and yet BBC Records do not report a sale of that or any other Jon Pertwee story to Nigeria (and there are certainly not enough airdates in the Kano listings above to support any such additional screenings). This blogger HERE says "state TV stations in Nigeria back in the day played those early seasons of Tom Baker as Dr. Who over and over again all through the late 80s and probably into the 90s. Ask many Nigerian, Tom Baker (Dr. Who from '74 - '81) is the one and only Dr. Who." These various online comments indicate that not only did the series cycle around the various NTA stations in the late 1970s and 1980s, but that some were also regularly repeated for many years. There is no clear record that any stations in Nigeria screened Doctor Who after the runs across the various NTA stations had concluded. "What sparked it off was an interview on a Radio 2 magazine programme with a technician (from this country [i.e. England]) who is involved in setting up a satellite education / communications system to Nigeria. It was he who revealed how backward Nigerian TV was, being all black-and-white with the most recent DR WHOs (as a comparison with our network) being those with Troughton in. Steve Bryant [who was Archive selector at the BBC] checked up on this and indeed the BBC did purchase [sic] the Troughtons years ago." This last point is very important; we now know that several different stations in Nigeria aired various Troughtons during the 1970s, but that distinction was not known to anyone at that time. We are not told where in Nigeria the technician had been, but it would presumably have been Lagos, where the NTA was based. The quote from DWB also says "indeed the BBC did purchase the Troughtons". This is clearly a typo: but what is the error? Should it be "indeed the BBC did sell the Troughtons" or "indeed the [initials of a Nigerian station] did purchase the Troughtons". Is BBC a mistake; is the name of the Nigerian station that DWB is referring to but mistyped as "BBC" supposed to be the NBC? Also, Nigerian TV wasn't necessarily that backward; as we've noted above, Tom Baker episodes were airing in colour in syndication in various states at that time. If anything, what the technician was meaning by "backward" was that despite them having colour transmission capabilities those Nigerians with TVs still had black and white sets. "… [it was] a Radio 2 broadcast concerning the setting up of educational satellite TV in Africa. During the interview, the relative state of Nigerian TV and our own was made by a comparison of the two countries [sic] DOCTOR WHO output; theirs being all black-and-white and featuring a Doctor thought to be Patrick Troughton." But note that it was here stated it was now "thought to be Patrick Troughton", which shows that there was still clearly a degree of uncertainty as to what the technician had supposedly seen. And to add even more confusion, ex-BBC archivist Steve Bryant told Stage & Television Today (in the 4 July 1991 edition) that "a Radio One DJ had been there [to Nigeria] and joked that they're so far behind there that Dr Who is still William Hartnell. The fans jumped on it, we got in touch with the Nigerian Broadcasting Authority, they tracked it down and we got two complete stories, including The War Machines". It's clear from Bryant's comments here (even if he is slightly off the track with his belief that it was Hartnell, and a BBC DJ who had made the claim) that he considered what the "DJ" [sic] had said was done so in jest, rather than as a statement of fact. There are no further sales of 1960s' Doctor Who to Nigeria noted in any BBC records beyond the final two season 6 serials in 1976. There is a very remote possibility that further screenings of Troughton episodes took place in Nigeria but they were repeats (either paid for or unpaid for) of stories bought already than of additional stories acquired from somewhere illicitly. Unless a copy of this 1984 Radio 2 interview surfaces we will never know precisely what was said nor the context in which it was said. We have mostly accounted for all 200 airdates for Doctor Who that screened in Nigeria between 1965 and 1980, ten of which are "repeats" of The Web Planet and The Time Meddler. Gravitron Moonbase crewman Ralph deBayo (played by Mark Heath) wears a Nigerian flag on his tunic (The Moonbase). This page was last modified on 21 August 2017, at 02:31. This page has been accessed 99,707 times.